Spirituality Workbook is many things: a book of riches and surprises; a guidebook for explorers who want their spiritual life to go deeper; an invaluable aid for those seeking to travel faithfully in a strange land; and it is itself a journey through the many facets of Christian spirituality. In five sections, David Runcorn suggests an integrated vision for Christian spirituality. 'Then and now' looks at roots, historical and ancient spiritual ways, and the rules of living for diverse communities and their modern relevance. 'Life together' considers the essential role of community in spirituality, while 'Becoming who I am' explores the relationship between spirituality, humanity, identity and the stages of our life journey. 'When you pray. . .' examines some of the ways we pray and our understanding of prayer. The final section, 'In the midst of life', is about Christian spirituality lived in the real and sometimes messy world. The author provides numerous inspiring and engaging examples, exercises to bring the text alive and to help us apply spiritual techniques, and suggestions for further reading. All these make this a book to live by as well as one to pray and learn with. 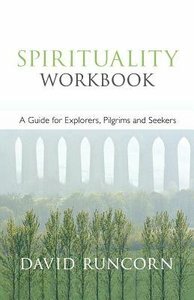 - Publisher Spirituality Workbook is many things: a book of riches and surprises; a guidebook for explorers who want their spiritual life to go deeper; an invaluable aid for those seeking to travel faithfully in a strange land; and it is itself a journey through the many facets of Christian spirituality. What are the great spiritual practices of the Christian tradition and what do they teach? What can we learn from them to deepen our own spiritual life, and understand more fully the spiritual lives of others? Spirituality Workbook is many things: a book of riches and surprises; a guidebook for explorers who want their spiritual life to go deeper; an invaluable aid for those seeking to travel faithfully in a strange land; and it is itself a journey through the many facets of Christian spirituality. What are the great spiritual practices of the Christian tradition and what do they teach? What can we learn from them to deepen our own spiritual life, and understand more fully the spiritual lives of others? David Runcorn is the teacher of Spirituality and director of pastoral studies at Trinity College in Bristol, England. He is the author of several books, including Space for God, Silence, Holiness, and Rumors of Life.